Many of us were raised to not talk to and be wary of strangers, but the sad fact is that kids are much more likely to be taken advantage of or abused by someone they know and think they can trust. This reality was the driving force behind Bracha Goetz’s book Let’s Stay Safe, which was published in English in 2011, and just came out in Yiddish this summer, as Zai Gezunt. Born in Queens, N.Y., Goetz graduated from Harvard and started on the road to becoming a psychiatrist before heading to Israel for what was to be one summer. However, while in Israel, she become observant, and ended up staying. There, she did a further 11 years of study, got married and had a family. Goetz and her family have since moved to Baltimore, where she coordinates a Jewish Big Brother Big Sister (JBBBS) program. As well, she writes children’s books and, to date, has published 36 of them. “They are all spiritual children’s books,” she said. “Originally, I was just writing Jewish children’s books, but now I’m also writing spiritual children’s books for anybody. “I always wanted to write spiritual books for everyone, but I just recently found a publisher that was interested. It’s not easy. It took a long time, but I’m very happy to do that, because, although these are Jewish concepts, they are also actually universal concepts that I’d love to share with any child. In her role at JBBBS, Goetz witnesses firsthand how sexual abuse affected children. This made her think about how she was teaching her own children about such dangers. 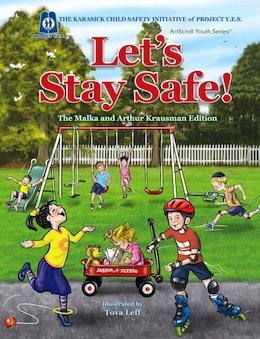 Let’s Stay Safe, which was published in English in 2011, and just came out in Yiddish this summer, as Zai Gezunt. Goetz wanted to write a book that would be accepted by the Orthodox Jewish community specifically, as the subject tends to be less discussed in these communities. So, she wrote Let’s Stay Safe, but could not find a publisher. That is, not until Rabbi Yakov Horowitz, dean and founder of Yeshiva Darchei Noam in Monsey, N.Y., agreed to help and got the book accepted by ArtScroll. “He really worked at it, and it was a really groundbreaking book,” said Goetz. “There was nothing like it out there. We wanted readers to understand that these were additional normative safety rules that needed to be adhered to by children to be safe. Of course, the book is also for parents, because, when parents read it to their children, they also gain an awareness. One of the concepts Goetz wanted to stress in the book was that children speak with a parent even if somebody touched them inappropriately a long time ago. It is important for these experiences to be told, she said, so that survivors can heal, and also so that the perpetrators cannot continue abusing children. Another concept she wanted to convey clearly is not to trust someone just because she or he is dressed in Orthodox clothing, as that does not automatically mean they are safe people. “There’s one picture of an older teenaged boy at a camp,” Goetz said, by way of example. “Many times, it’s a familial problem, where it’s an older brother, an uncle, a step-brother who is the perpetrator. Just this week, I was in a community different than I was usually in, but the people knew I was the author of the book … and, this happens a lot, people come to me with questions. I was outside watching my grandchildren and a mother came by and said, ‘Does this seem right? There’s a teenaged boy and he’s playing with all these little children. He’s playing ball with them. He doesn’t live in this community. And why is he here? He’s Orthodox, as well, just as the children, but he didn’t know any of them. Why was he playing with them?’ I said that’s definitely a red flag. Books written by Goetz are appropriate for kids ages 2 and up, but are better starting at the ages of 3 or 4. Other books written by Goetz touch upon topics like eating healthily (and enjoying it), teaching children sensitivity, and teaching people how to interact more naturally with children with special needs.